Posted in: BSU Journal Club. Tagged: lunar eclipse, solar eclipse. 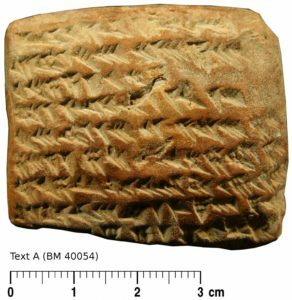 Today, in the first summer meeting of our research group, we discussed a recent paper from Prof. Guillermo Gonzalez of Ball State that explored observations from Babylonian clay tablets to estimate changes to the spin rate of the Earth. Even though it seems like there’s never enough time in the day, it turns out that the Earth’s rotation rate has been slowing over thousands (and even billions) of years. Numerous effects, including tidal interactions with the Moon, reshaping of Earth via earthquakes, and the melting of glaciers, all contribute to slow down or speed up Earth’s rotation. One good way to measure the change in the length of the day is to measure the positions of stars, planets, and the Moon in the sky and compare their positions with where you’d expect them to be based on the time. And going back to about 1600, astronomers have used telescopes to accurately measure the timing of celestial configurations to good enough precision that changes in the length of the day can be seen – for instance, the day was about 22 minutes longer when Galileo first pointed his telescope to the heavens. But the change in length of the day is pretty small – the Moon’s tides slow the Earth about 2.3 milliseconds per day each century – and the change isn’t necessarily constant over time. Fortunately, even thousands of years of ago, humans were keeping track of the positions of objects in the sky, even though they didn’t know what the objects were. Gonzalez’s results mostly agree with previous work, although he finds that the Earth’s rotation has slowed a bit more slowly than other estimates suggest since the time of Babylon.